Our award-winning technology magazine that has informed and entertained NaSPA members for almost 30 years. We welcome your article submissions, press and product releases, advertisements, and other information of interest to our members. 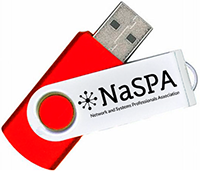 Drop us a line at editor@naspa.com to contribute or at advertising@naspa.com to help us sponsor this great publication! New! Now you can receive each edition FREE as it comes out. Sign up HERE. The FreeBook: Cybersecurity: Intrusions, Vulnerabilities & Systems is relevant to IT, Networking and Telecommunications professionals. NASPA chose this collection of relevant material based on a recent survey conducted with their members. This book covers securing power systems, cybersecurity intrusions, vulnerabilities in the organization and the role of the CIO. InformIT is the online presence of the family of information technology publishers and brands of Pearson, the world's largest education company, with 40,000 employees in more than 70 countries helping people of all ages to make measurable progress in their lives. Pearson provides a range of education products and services to institutions, governments and direct to individual learners, that help people everywhere aim higher and fulfill their true potential.